We go through a lot of nonsense for a good espresso. Sometimes I wonder if it's worth it... sometimes. photo originally uploaded by hazelsheard. Simon's Coffee Shop has been working with a delay timer on the machine for the last few weeks. The basic setup involves a flow regulator and an adjustable delay timer that controls when the rotary pump kicks in. The idea is that you use the flow regulator to control line pressure during a 'pre-infusion' where the pump does not kick in yet. To set it up, you adjust your line pressure to get your first drip at a desired time. Let's say in this case, 5 seconds. Then you setup your timer to kick in at that same 5 second mark and your pstat will swing up to 9 bars at that point from your line pressure of say, 4 bars. This involves a lot of grind tweaking and adjustment during the early stages and graphing it would be weird so don't ask. You then go through a series of adjustments testing from 3 seconds on up to 10 seconds to find the right balance for your espresso(assuming a fixed dose/extraction volume... at least temporarily). It helps to have an ideal batch of roasts lying around or work with it over a week or two instead of trying to coffee out and fix it in one night. The original idea we had was that we could imitate the Synesso's style of pre-infusion where the pump kicks in at your manual control. Often overlooked on a Synesso, you can soak the puck with line pressure by moving the paddle to the middle position and then let pump pressure start when the paddle is moved to the full on position. The delay timer/flow regulator setup is meant to imitate this in an automated manner. It's a hack. Don't get me wrong, I don't profess anyone should install this setup on their machine unless they know what they are getting into. For the price though, it gives you an almost lab style setup to make adjustments and we should credit whoever we originally took the idea from but I can't remember who we stole it from. Of course, a local tea guy is now treating it like the greatest thing since sliced bread and intends to push this as a solution to consistency(user/roaster) ills involving espresso at a small profit, of course. He thinks it will take out the variation in espresso. It's not a cure all and in all honesty, if the roast has wild variations, homogenizing the brew method is only hack compensating. If people don't have the fundamentals in preparing espresso and clean grinders with new blades, none of this is worth even debating. That said, everything in espresso starts with the roast. In Simon's case, he is using a prolonged(close to 9 seconds) pre-infusion to build mid tones and smooth a roast that had very little mid tone on the cupping table. He's also using a low brew temp to mellow sharp acidity into something more approachable to the general espresso drinker's palate. Simon isn't trying to reinvent espresso or try to force a new perspective on espresso that everyone else 'should follow.' 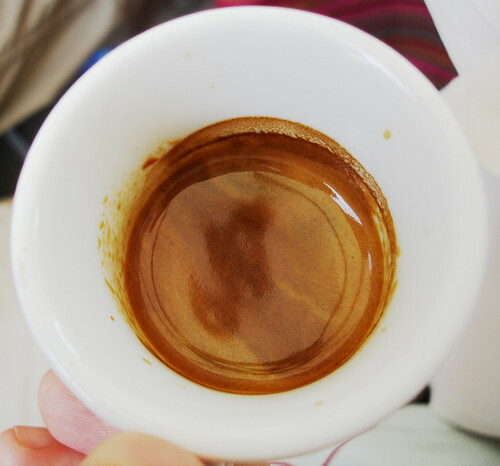 The result is a very approachable but not super complex espresso that fits his personal palate. While roasted for high tones and lemon acidity, this Brasil comes out mellow, clean, and smooth nuttiness with hints of cocoa after all the tweaks. I think that's a great thing when the espresso matches up to the owners personal palate very well. I find it educational and a lot of fun to muck around with experiments like this. Realisticaly, a newer machine likely would negate the need for such modifications. A Synesso, FB series LM, or GB5 completely negates this setup since the pre-infusion is built in already. Most heat exchangers have a mechanical preinfusion built in and won't work with this either but a machine like older LM Lineas could be modded with this setup just for curiosities. A few more changes since and the shots for Simon are now a very low line pressure with a 7 second timer delay at 196F 17g. If I implied that you absolutely had to sync first drip with pressure kicking in, you don't.